Metro by T-Mobile highlights, in one of its latest ads, that you can enjoy great savings when you switch to Metro. 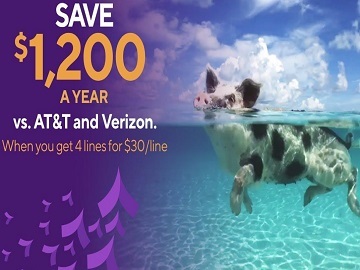 The 15-second spot features a pig swimming in the ocean and saying he went on a trip to the Bahamas with the money he saved by switching his family to Metro by T-Mobile. “You know what I did with all the money I saved by switching my fam to Metro? Got us a trip to the Bahamas,” the pig says. At the end of the commercial, which features the instrumental part of Usher’s 2004 single “Yeah!” featuring Lil Jon and Ludacris (from Usher’s fourth studio album, Confessions, released in 2004), the voiceover urges viewers to save $1200/year over AT&T and Verizon on a great network. The ad also informs that the savings claim is based on 4 lines on Metro 4/$120 Unlimited LTE rate plan vs. Verizon Beyond Unlimited and AT&T Unlimited & More Premium without autopay discount including taxes/fees. Since launching its new advertising campaign, following the acquisition by T-Mobile, Metro by T-Mobile has used various animals to pitch its deals, from wildebeests to grizzly bears to penguins, otters and giraffes. The latest commercial from the carrier features two giraffes who catch all the basketball they want with Metro, which covers 99% of people in the US. The previous ads featured two wildebeests on the bank of a river, talking to each other, two grizzly bears talking about the company’s new plans, that include unlimited high-speed data, Amazon Prime for entertainment and Google One for more storage, a family of penguins talking about the company’s deal that offers 4 new lines for $100, and an otter swimming in a hot spring, that switched his whole family to Metro and is now saving $1200 on a great network.